Before any of you get any misconceptions, let me just make this clear: I am not obsessed with Jamie Oliver. However, while he may make too many dirty dishes, he does have some good ideas when it comes to quick food. I have both the 30 Minute Meals and 15 Minute Meals cookbooks and they are fantastic – even though they always take longer than they claim. Of all the recipes I have tried from each, I have only had one failure – although that was pretty much inedible so take from that what you will. This recipe is from his 15 Minute Meals collection and it is a complete diamond. Using a grated butternut squash as the base for a curry is genius; not only does it cook in like one-fifth of the time butternut squash normally takes, meaning you can easily cook this on a week night, but grating it also means it basically act as a thickener and you end up with a smooth, luscious curry base. The curry paste that you make and add to the grated squash and stock is full of things that you would typically associate with Thai food: ginger, peanut butter, chili, cilantro (or coriander for our British readers), fish sauce, sesame oil and soy sauce. Each of those ingredients is delicious on its own, but together they could raise the dead with the flavor they pack. You can use whatever type of noodles you feel like using, just make sure you don’t overcook them – there are few things worse than mushy noodles. I think you can get away with fewer noodles than the recipe recommends, so just use your judgement. Also, the half fat coconut milk saves calories and tastes just as thick and delicious as the full fat version, so don’t be afraid. I chucked in some chopped frozen spinach for some added green which basically just melted and was pretty much indiscernible – but at least you know you’re getting some iron! I left out the asparagus for the simple fact that it is too expensive an ingredient for a midweek dinner and the ones in our supermarket were flown in from Peru – not exactly buying local, is it? 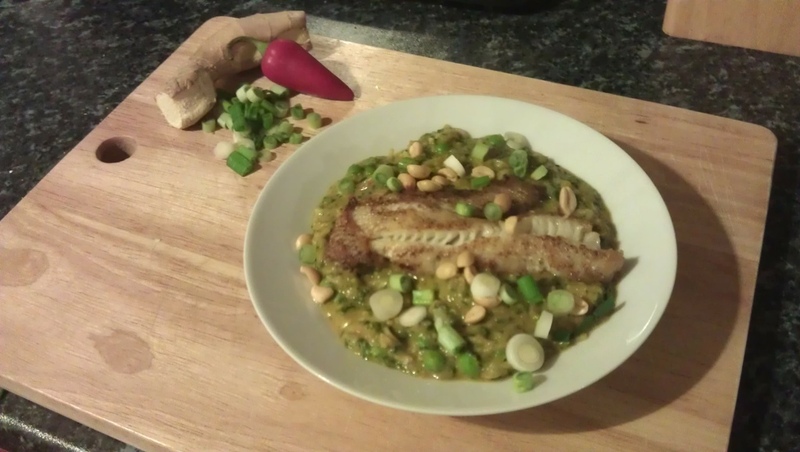 The first time I made this dish I also made the chicken that accompanies the laksa in the book which was delicious. However, this time I wanted a lighter version with less faff, so I poached a couple of white fish fillets in the laksa for the last few minutes of cooking time. It tasted great, but it wasn’t the prettiest thing I’ve ever made so you’ll notice that the finished picture has a lightly fried fish fillet on top rather than the original poached version. The things we do to look good, eh? Either way, the fish was great with it as I’m sure pork, beef, prawns, or tofu would be as well. So, if you want something to pep up your midweek meals without spending hours in the kitchen or millions at the grocery store, look no further.